Here the link to the liveblog from Deizisau for the Sunday games with Rodewisch-Deizisau and Bad Königshofen-Schwäbisch Hall where it can come to a first decision of the German Championship depending on the result. The first update will com at 9:00 after a one hour shorter night due to the change to daylight saving time. Nino lost the endgame, so the final result is 3,5-2,5. Now the chances fot championship are bigger than ever, in Berlin first opponent is Deizisau and then Munich and Augsburg from the bottom of the table. Katia won against Savina!!! It is 3,5-1,5 for Schwäbisch Hall, Nino is still fighting. Elena Levushkina wins against Melanie Lubbe, so the final result is 4-2 for Deizisau against Rodewisch. Hanna Marie Klek won her endgame, so it is 3-2 for Deizisau against Rodewisch. Lela draw against Gunina through a perpetual, also a very exciting game, 2,5-1,5. Now if Katia wins, it is over! Time control is over, 3 games still running. Lela at board 1 completely unclear for us amateurs. Nino is a pawn down in a knight/bishop vs. 2 knight ending, this might just hold. Ekaterina has a pawn on the second rank and is better. Iva won a completely crazy game against Jana Schneider, at the end it was 2 queens against 2 rooks, a bishop, a knight and a pawn on the 7th rank. So it is now 2-1 for Schwäbisch Hall. 1-1, Sophie won her endgame. 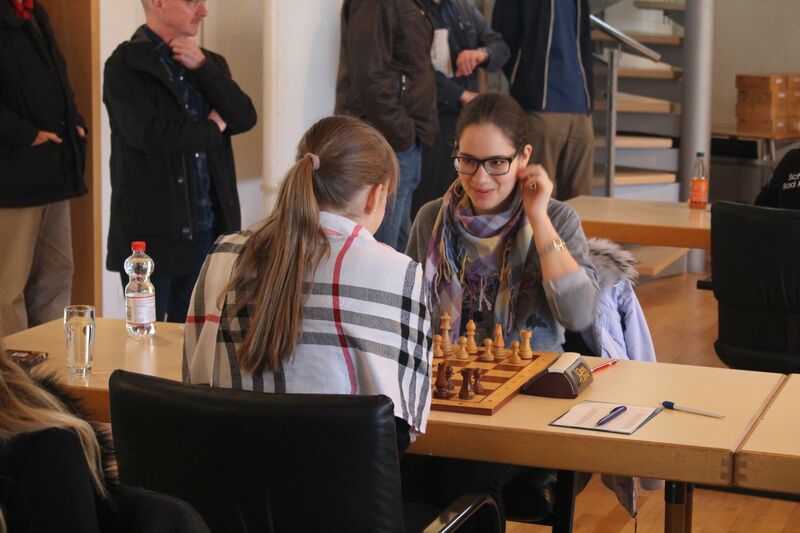 Deizisau-Rodewisch is 2-2, board 1 and 2 ended with a draw, and Miturova won against Straub. Bad Königshofen is 1-0 up, Olga Girya wins against Alina Kashlinskaya. In the other match, Deizisau leads, Mara Jelica won on board 6. On almost all boards there are extremely sharp positions: Gunina is attacking with f5 and g5, Girya sacrificed an exchange against Alina. Board 6 is completely crazy: Iva has a queen against Jana Schneider’s rook and piece, but the position is extremely sharp. Only Sophie has almost decisive advantage against Maria Schöne. All positions are extremely interesting, there is no really „boring“ position. Especially board 6 now becomes very sharp as within the next moves probably various pieces on both sides will be hanging. Sophie has some pressure against Maria Schöne in her revenge-game for last year’s loss. In the other game, especially the German duel between the former teammates Elena Levushkina and Melainie Lubbe is interesting. At board 4, Hanna Marie Klek is a pawn up, and there is only little compensation. Not much has happened yet. „Endgame“ for Alina’s game was a bit premature (I was told this by a team colleague), a very sharp position with opposite castling has originated. All other positions are still at the end of the opening phase. Here the pairings of today. Rodewisch has now 6 players, Hana Kubikova had to work yesterday, therefore she could not play. And for Schwäbisch Hall Lela Javakhishvili is playing instead of Karina Ambartsumova, a small surprise, but a little bit expected by the opponent. So Alina Kashlinskaya now plays her old firend Olga Girya, and they are already almost in the endgame after 10 minutes.